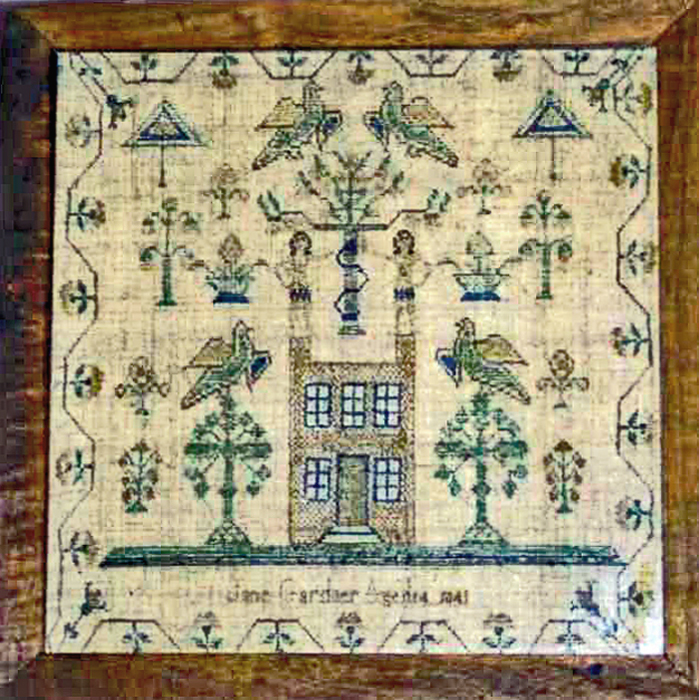 Jane Gardner worked this endearing sampler featuring Adam and Eve under an apple tree with a serpent winding around it. This Biblical image, along with a very large house and a variety of other sampler motifs, combine to make this a very engaging presentation. While most of the Adam and Eve samplers we see are English, this subject was also popular in America, most likely due to its religious significance and the role religion played in the lives of the young needleworkers. The deeply arcaded dianthus border includes a rose sprig in each of the four corners and provides a larger than life framework for this charming sampler. In fact, everything about this presentation is larger than life . . . especially the house and of course the four doves. The imposing Federal double-chimney house immediately draws our attention and, as our eye travels up we find Adam and Eve standing on the chimneys! In all of the Adam and Eve samplers I've seen, I've never seen them depicted this way! This charmingly naive` presentation cannot help but bring a smile to one's face. The blue silk accents in the latticed windows, door trim, serpent, and the doves wings provide excellent contrast in this exceptional needlework. The use of the cross-stitch is very effective in depicting the brick fascia of the imposing house making this all in all an excellent example of this genre` and a worth addition to any serious collection. Our samplermaker, Jane Maria Gardner was born8 Aug 1823 and married Deacon Horace Wells Talcott on October 9, 1842. They had 3 children . . . Rosella, Horace, and an unnamed male infant who died and was not named. The census shows Horace to be involved in Wool Manufacturing in one of the many Mills found in that area of Connecticut where they lived . . . (Talcottville, perhaps named after his family?) He died in 1871 while Jane died on Dec. 21, 1888. The sampler is worked entirely in cross stitch, the condition is excellent and the color strong. It is conservation mounted on acid free in a frame with old bubbly glass. Sampler size is 17" x 18".